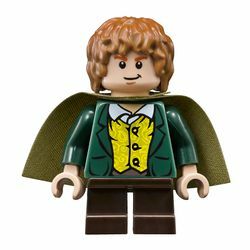 Meriadoc Brandybuck, commonly referred to as Merry, is a Lord of the Rings minifigure released in May 2012. He is exclusive to 9472 Attack on Weathertop. Meriadoc Brandybuck was part of the Fellowship of the Ring, along with Gandalf, Boromir, Aragorn, Frodo Baggins, Gimli, Legolas, Samwise Gamgee, and Peregrin Took. He was with the Fellowship in Moria, Lothlorien, and at Amon Hen. He saw Boromir fall, after which he and his fellow Hobbit Pippin were taken by the Uruk-hai. However, they escaped after the Uruk-hai were attacked by the Rohirrim on the Riddermark, at which point they fled into Fangorn Forest. In the forest they found Treebeard, and ent, who saved them from Grishnákh. They convinced the Ents to attack Isengard, and with that stop Saruman from destroying their wood. After this attack, he and Pippin reunited with Gandalf, Gimli, Legolas and Aragorn, and went back to Edoras. He was with the Rohirrim in the battle of Pelennor Fields, and survived the Battle of the Morannon. Merry, short for Meriadoc Brandybuck, is a Hobbit and a good friend to Frodo. He literally stumbles into the Fellowship by accident after getting caught stealing vegetables from a farmer in the Shire. But what is a hungry Hobbit to do? Merry is a smart Hobbit. Besides food, his interests include books and maps, which come in handy as the Fellowship prepares for their quest. But there is much more to Merry than booksmarts. He will discover just how big a difference a small Hobbit can make. He appeared at the battle of the Black Gate in the The Lord of the Rings: The Return of the King and was playable in that level in LEGO The Lord of the Rings: The Video Game, although in the book he was injured during the battle of Pelennor Fields and was forced to stay behind. 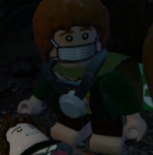 Because he and Pippin wear the matching Elven cloaks, the background for Merry's character token in the video game is green. Merry Merry, short for Meriadoc Brandybuck, is a Hobbit and a good friend to Frodo. He literally stumbles into the Fellowship by accident after getting caught stealing vegetables from a farmer in the Shire. But what is a hungry Hobbit to do? Merry is a smart Hobbit. Besides food, his interests include books and maps, which come in handy as the Fellowship prepares for their quest. But there is much more to Merry than booksmarts. He will discover just how big a difference a small Hobbit can make. This page was last edited on 14 December 2016, at 21:54.